Blavity's Creative Society had the honor of speaking with Selam Bekele. Selam is a multi-media artist and experimental filmmaker from Addis Abeba, Ethiopia. She holds a bachelor of arts degree in both visual communications and film production from the University of California, Davis. Selam was awarded a creative grant by the Yerba Buena Center for the Arts to create a collection of work that deals with belonging and migration for the East African Diaspora. 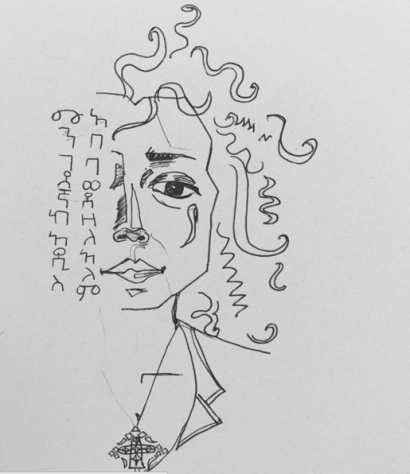 Under this process, Selam began creating what she now calls her TZTA Collection, which features interactive pieces, sound-art and her first short film, Prince of Nowhere. 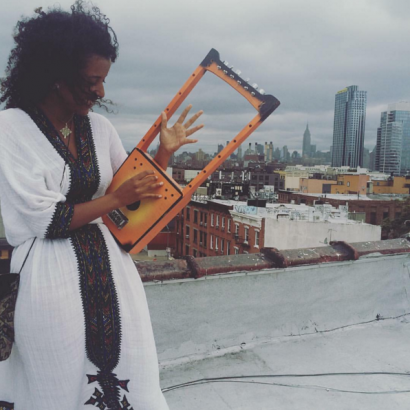 Her fluid use of sound, video and performance has allowed Selam to create community and cultural impact as a filmmaker, DJ and curator. Blavity: Much of your work centers around place, belonging and diaspora. Being part of a diaspora evokes feelings of belonging everywhere and nowhere, have you found solace in this? Is there a way to find belonging that isn’t attached to a particular place? Selam Bekele: I find solace in my own motion. Movement is home, and that's why so much of my work is interactive and constantly changing with the user. I tweak my film every time I screen it. I allow the changing lights and unique spaces to reform the colors and shadows of my installations. I find solace in change and I want users that experience my work to feel that motion too. It's about transcending definition and borders. It's about embracing the nowhere, the Abyss and the potential energy in empty space. B: You are a master of many trades, DJ, filmmaker, curator and more. It is refreshing to see that you aren't limiting yourself to one mode of expression. What words of advice do you have for black creatives who want to carry out similar careers? SB: Thank you. I have to honor myself and my creativity and make sure I am living my full potential rather than being confined by the categories of others. I have a degree in film and originally pursued filmmaking full-time. Then I started DJing and curating shows because I realized I really love cultivating spaces for people to challenge assumptions and feel inspired by new concepts. Now I do a lot of different kinds of work and I love the diversity in my day-to-day life. It's truly a matter of staying true to yourself and having patience. instagram.com/selamx B: In your work, you rarely shy away from topics surrounding social change, race and/or gender. How do you channel your frustrations with oppression into your work? In turn, how is your work motivated and influenced by injustice? SB: A lot of my work is conceptual and can be translated in many forms. But being who I am, living in the body I live in, coming from where I come from — it’s impossible for the space that I occupy to not be political. I was born in Addis Abeba during a very violent time of war and corruption, and that set a very distinct tone in how I view the world today. Producing much of my early work in Oakland has also been very influential. Oakland demands substance and a political stance for revolution. You’re in the home of the Black Panthers, of Sun Ra’s Space is the Place, of Angela Davis and Huey P. Newton. You have to have a message, even if its abstract. So everywhere I go, and with everything that I do, I’m representing the places and people I’ve met along the way. B: Describe your creative process. How do you go from idea to execution? SB: It's kind of like music. A word or a feeling invokes a particular sound and I try to continue from there through various mediums until something bare and honest is communicated. I question what kind of assumptions and fears I am entering with and I continue to listen to that rhythm in spite of the ugliness it is sharing with me. It's truly a matter of listening and not being so transfixed on the end-result, but allowing myself to be a student in my own process. Prince of Nowhere international premier at CinemAfrica Festival in Stockholm, Sweden.